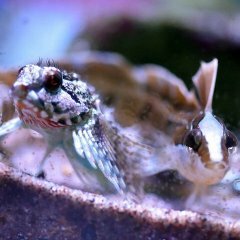 Hey all, ive recently decided to keep a mantis shrimp and i am wondering two main things: what is the best species for a 100 litre (about 22gal) and what are the parameters needed (salinity, temp (assuming 24-26°C), phosphates/nitrate)? Ive looked and not found much beyond that they are hardy and there awesome vision. For the set up i am going to keep it simple, lots of sand (thinking about 4 inches deep) and live rock. Maybe some soft corals or some sea grass if i can get it. Would the seagrass help mop up excess nitrates and phosphates? Or would the shrimp dig the plants up? Food wise i am thinking a mix of live and dead. Should i get a smashing species, Snails and crabs are rather easy for me to collect (i live 3 or 4 miles from an estuary so plenty of periwinkles, cockles and shore crabs) i can always buy live mussels from the fish counter if need be (i am quite partial to a bowl of mussels!) And for slashing species i can always buy a few fish fillets and put the slices in the freezer, or i can get ragworms and lugworms from a fishing shop. Ive also read that they need iodine for molting, are there any kits that test for it? Or should the salt mix contain enough for them? there are a number of species with the most common being the Peacock, which grows up to &” and needs a big tank. i hope to find a smaller 2” one n house it in a 10 gal. Some are not hardy.... The false peacock is sensitive and more difficult and some species such as the true peacock are prone to shell rot of the the tank isn't kept clean. Smithi and wennerae are hardy. Parameters should be kept similar to a reef tank. Regular water changes will replenish iodine...I would not dose it...a overdose could lead to premature molt and death and I would not trust our hobby test kits. Live foods will help keep the mantis from being bored but frozen can be soaked in Selcon for a vitamin boost. I did a mix of both. Are all the gonodactylus species hardy? Or should i simply focus on g. smithi? What about peusdosquilla? Are they suitable? Are all the gonodactylus species hardy? Or should i simply focus on g. smithi? What about peusdosquilla﻿? Are they suitable? Those two I listed are just the more active hardy smashers. I have never kept this one but I think that one should be fine too. 9cm is right for a smithii. I would probably stick to natural sand for them, they need to be able to construct a burrow. Give them plenty of rock rubble too. Also I faintly remember someone having issues with the black sand damaging their mantis. I believe this sand is made up of lava rock so possibly more scratchy or sharp? You can try it....I have never used play sand as most people seem to vote no on it's use due to silica and the way it is stored...that it gets dirty. Petco sells a cheap dry reef sand but I'm not sure where you are located. I would look for people who have used play sand successfully. I have what I believe to be a Pseudosquillia ciliata, and it's done well so far. It was in my LFS for 2 months, and I've had it a week or so now. Eating frozen readily. The Berkeley website on Mantis species lists them as excellent aquarium inhabitants. while aquarium cracking has happened...it's a rarer than rare occurrence and not something you really need to worry about. that said, it's the smashing types that would crack an aquarium, not the spearing. I lined my bottom with acrylic for peacocks and chiragra but the others are a lot less powerful. Then again if it is a rimmed tank...my dog broke one of those with minimal effort.....damn glass so thin. Not as thin as horticulture glass! 3mm thick and no ground edges! When glazing my greenhouse the glass got me several times! But i didnt break a pane!